A while ago I received another e-mail which surprised me the most. 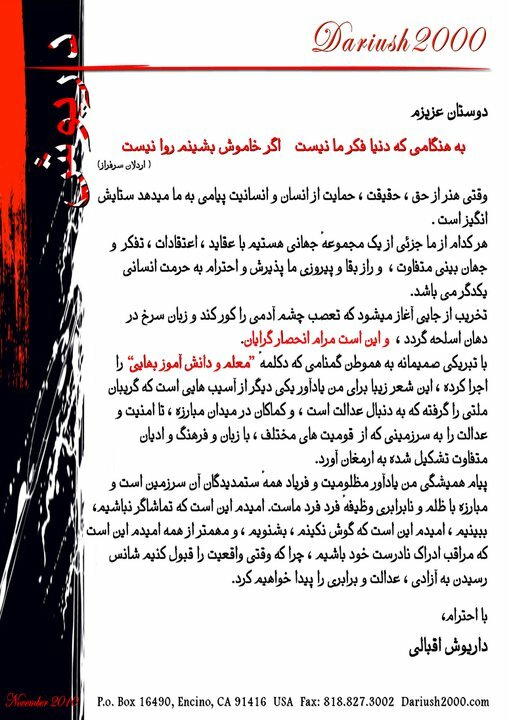 This was a statement, a most gracious statement released by Dariush about the incident. I read it and thought, what a gracious human being, what a noble sentiment, what a humanitarian spirit. Then I caught myself thinking, this is such a new and unprecedented reaction in the whole history of the Baha’i Faith in Iran especially from the celebrity in Iran. A few years ago, if such a mistake would happened, heaven knows what kind of storm of protest would have been unleashed against the Baha’i community of Iran. The years of exile in a foreign land for many Iranians and the years of suffering patiently and with unparalleled integrity by the Baha’i community of Iran has awakened many of the Iranians to the plight of their Baha’i brothers and sisters and they no longer wish to remain silent. We like to congratulate Dariush for such a loving and unexpected response. he, all of a sudden, appeared much taller in my mind and for the first time, i now know his last name and also looked up hi picture. he will definitely be one of my respected celebrities of Iranian music. This entry was posted in Farsi, News, Stories and tagged Bahaí children in Iran, Darius Eghbali, human rights in Iran, justice, koodak-i-Dabestani, peace. Bookmark the permalink. Dear Sina, I hope your message gets to Darushe. I also would suggest you post it on his face book. on quality backlinks building, it will help you to increase traffic.